Call me an Amazon loyalist by default. As in, it’s da fault of the competition. Case in point: I needed to buy an air purifier. My research revealed that Honeywell tends to make the best ones in my price range, and their latest model is the Honeywell AirGenius 5 sold in many stores. So like most 21st century consumers, I performed a quick price check. 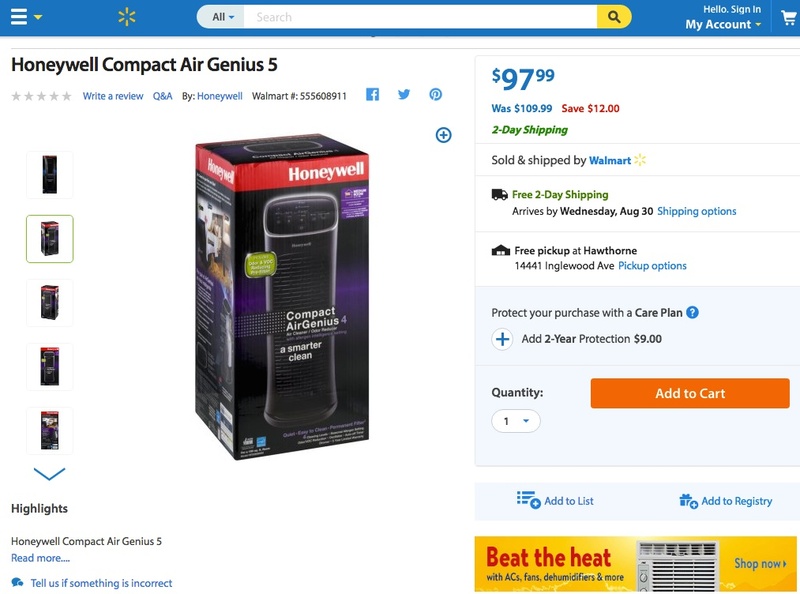 Google showed that the lowest price for the Honeywell AirGenius 5 was at Walmart and its subsidiary Jet.com, both carrying it for $97.99. That was significantly lower than Amazon’s $156.64 for the same product. Woohoo, what a deal! While both claimed to be selling the AirGenius 5, all but the top picture on each site showed the Compact AirGenius 4 — a smaller, older model which also sold for $97.99 at Amazon. 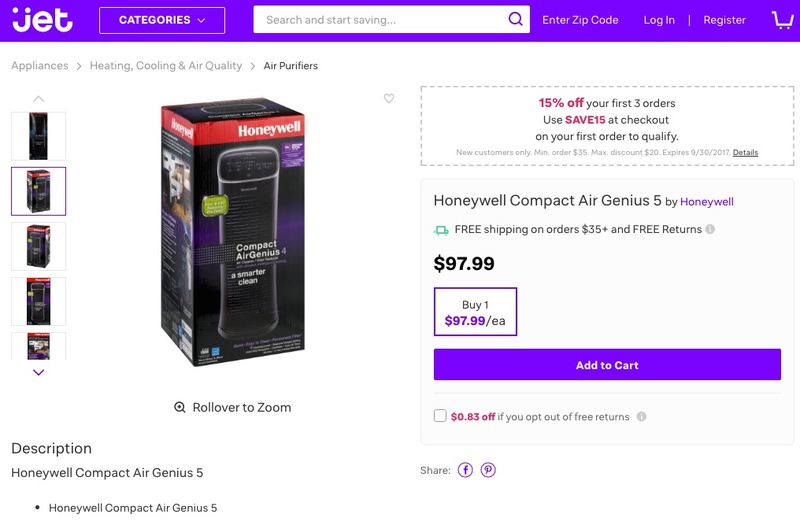 In addition, both Walmart and Jet.com lacked details about the product, so there was no way to confirm which AirGenius I would get from them. My guess: if I ordered the full-sized AirGenius 5 from either Walmart or Jet.com, I would likely get a compact AirGenius 4 instead, or an error message now or later (“We’re sorry, but due to a mix-up, the product you ordered…”). If I were the litigious type, I could likely file suit for false advertising, but I’m allergic to courtrooms and hassles. So I simply ordered from Amazon. Convenience + confidence = sales. It’s not as though Amazon is perfect — I’ve found errors on their site, and they’ve made mistakes with my orders over the years. But those have been rare exceptions, and Amazon has always been quick to remedy their mistakes with refunds and easy returns. With Walmart and Jet, this smelled like careless management. After all, according to the Walmart blog on September 19, 2016, they bought Jet.com because it’s “complementary,” because of Jet’s “talent,” and because Jet provided a “unique, transparent way for customers to shop.” Yet less than one year later, the two sites were nearly identical, down to the exact same errors. So much for taking advantage of all that talent for a unique, complementary option. In the end, I and many other shoppers prefer Amazon. It doesn’t take a genius to figure out why. I agree!!! I recently tried to buy a wooden desk and did the price search. It’s the same on both Amazon and Walmart. Although I ended up ordering from Walmart because it sold out on Amazon, I didn’t like the Walmart’s website at all! Its shopping experience was bad. And if it was not because of Walmart’s physical store and its reputation, I wouldn’t trust it to give my credit card information. Thanks for your comment, Connie. Yes, there’s much more to ecommerce success than pricing — especially when there’s price parity. Walmart needs to wake up to that fact!